Some of our Asparagus harvest. 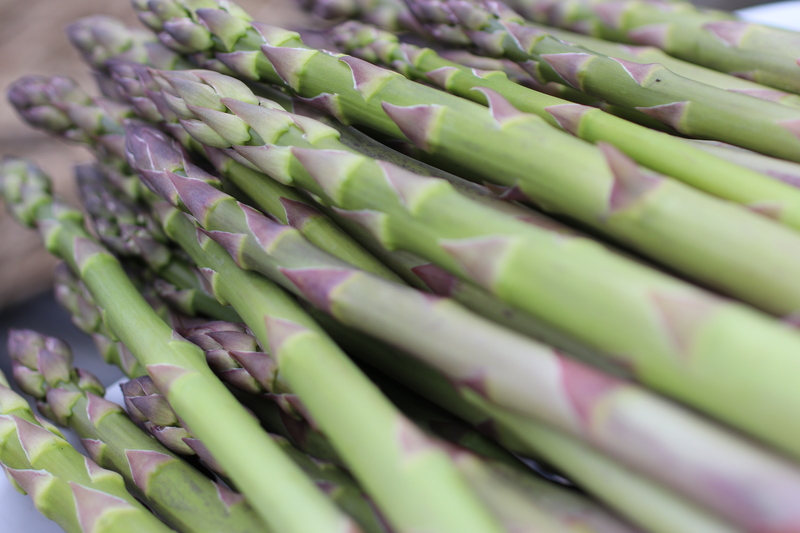 We usually harvest about 800 pounds of asparagus a year! Last week, the asparagus really started to come in. This is always an exciting, if somewhat exhausting time on the farm. We’re focused on getting much of our planting done, but also harvesting asparagus at least once a day. Sometimes twice a day! Asparagus is an important marker on our farm. It starts the season of great fresh eating. It also marks the point where we start to have a positive cash flow. And, because the market hasn’t started yet, we get to visit a lot of our customers as we deliver the asparagus. It’s also pretty. Last week was a bit tough keeping on-menu, so you’ll see some repeats. They’re repeats on the plan, not so much repeat meals, because I never made them. This next few weeks is going to be extraordinarily crazy as we pack three months worth of activities into four weeks of school, plus the farmers’ market starts up (I’m the vendor coordinator, so in addition to being a vendor ourselves, we’re organizing the other vendors). If I can manage even eating one home-prepared meal a day over the next several weeks, Ill consider it a success! Punt - probably munchies at Relay Fischoff National Chamber Music Competition winners masterclass.